A well-documented, unabashedly pro-Israeli examination of Muslim anti-Semitism. Bard (The Arab Lobby: The Invisible Alliance that Undermines America’s Interests in the Middle East, 2010, etc.) dives right into the conflict between Muslims and Jews, refusing to back down in any way while stating his arguments. 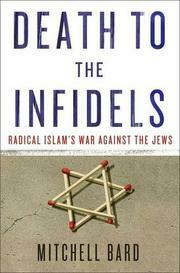 The author presents a comprehensive case regarding the Muslim world’s overt hatred toward Jews and, especially, Israel. His case is, however, far from balanced, which may turn off readers looking for a dispassionate exploration of the topic. Bard provides a detailed history of the modern conflict between Muslims and Jews, including a thorough discussion of the Zionist movement, creation of Israel and demographic changes among Arabs in the Middle East. He goes on to discuss the political realities facing Arab states, especially in light of the Arab Spring and its aftermath. Bard asserts that the West was naïve to believe the Arab Spring would bring democracy to the Arab world and that in fact, it only served as cover for the advancement of militant Islam. Bard is especially critical of President Barack Obama, whom he consistently describes as looking weak in terms of foreign policy. The author discusses the role of Jerusalem as well as past, unsuccessful attempts to bring peace to the Middle East. A chapter on “global jihad” points to worldwide anti-Semitism and the growth in influence of Muslims around the world, especially in Europe. Bard does not give serious attention to any arguments against Israel and mocks openness to Islam as misguided and dangerous (“The West does not even recognize that it is sowing the seeds for its own possible destruction”). For readers not put off by a one-sided approach, Bard’s unapologetic study provides worthwhile historic background and ample anecdotal examples (often bullet pointed for clarity) of violence against Jews.